One of the most famous legends of Shakespeare’s life is the story that Shakespeare might have attended some of the celebrations that accompanied Queen Elizabeth 1’s visit to Kenilworth Castle in 1575. It would have been easy for the 11-year old William and his father John to have made their way to Kenilworth on horseback from Stratford-upon-Avon. Royal visits were rare, so many local people must have flocked to see the monarch and the spectacular entertainments that Robert Dudley put on to impress her. It is suggested the three-week visit cost him the equivalent of £24 million. Early on, there was a magnificent firework display. We assume that people of the time would be easier to impress than we are today, but how spectacular were these early fireworks? A recent TV programme has tried to answer the question using a blend of historical research and experimentation. 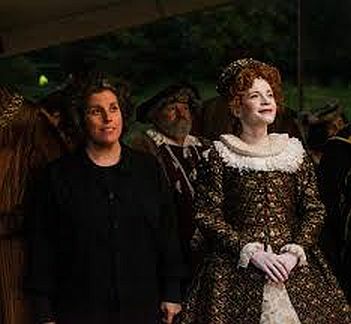 Fireworks for a Tudor Queen is another of Lucy Worsley’s re-creation programmes but it wasn’t just an opportunity for her to dress up (though she does appear as Queen Elizabeth). 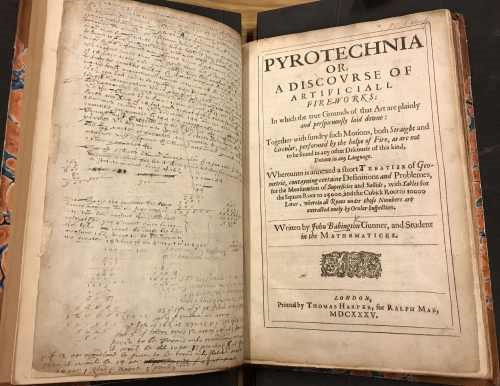 What made the programme compelling were the efforts to make Elizabethan fireworks, led by scientist and presenter Dr Zoe Laughlin, experts in pyrotechnics and practitioners. She started off making gunpowder, using a variety of ingredients including sulphur, charcoal and human urine, and went on to make implements on a lathe before setting off a number of explosions. It was great TV. We watched the construction of a Girandola, based on a cartwheel, that threw out showers of sparks and a rocket box which could launch dozens of rockets at a time. 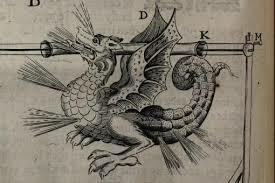 We were reminded that the art of firework-making had its origins in the violence of war, but there was beauty too in the building of a dragon, one of the most popular types of firework. A willow framework was covered in paper then loaded with fireworks that belched fire from every orifice as it moved along a wire. Queen Elizabeth’s visit to Kenilworth is known because of the publication of a “letter” written by merchant Robert Laneham. His eyewitness account, frustratingly, doesn’t go into any detail about the fireworks. The display included “blaze of burning darts, flying to & fro, leams of stars Coruscant, streams and hail of fiery sparks, lightnings of wildfire on water and land, flight & shoots of thunderbolts: all with such …terror and vehemence, that the heavens thundered, the waters scourged, the earth shook”. He was certainly impressed: “It would have made me for my part, as hardy as I am, very vengeably afeard”. It was said that the fireworks at Kenilworth could be heard from twenty miles away. 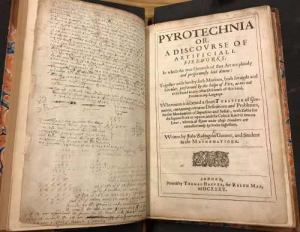 Without a proper description, Worsley consulted another book, Pyrotechnia, written by a gunner, John Babington in 1635. This British Library blog describes it. The book includes a diagram of an actual firework display, and it was this that they tried to reconstruct. The success of the programme was to show that these displays could indeed be spectacular, combining explosive power and beautiful effects. Although the possible Shakespeare connection wasn’t mentioned, the role of fireworks on the stage was explained by Dr Farah Karim-Cooper, Head of Courses and Research at Shakespeare’s Globe. It was a kind of firework, the setting off of a cannon onstage in Shakespeare’s play Henry VIII, that resulted in the burning down of the theatre in 1613. It’s always been a risky business. The story goes that the entertainment of Queen Elizabeth was Dudley’s last attempt to persuade her to marry him. Of course it failed, but probably not because he had failed to impress her with his wonderful display of fireworks. This entertaining and informative programme remains on IPlayer until 5 April 2018. This entry was posted in Legacy, Shakespeare's World and tagged Farah Karim-Cooper, fireworks, John Babington, Kenilworth, Lucy Worsley, Pyrotechnia, Queen Elizabeth 1, Robert Dudley, Robert Laneham, Shakespeare's Globe, Zoe Laughlin. Bookmark the permalink.